A bill to amend Nigeria’s National Minimum Wage was passed by the Federal House of Representative son Tuesday, January 29, 2019. The bill which proposed a new monthly Minimum Wage of ₦30,000, is a product of long negotiation among members of the Tripartite Committee on Minimum Wage set up by President Muhammadu Buhari. It is expected that the House of Representatives will send the bill to the Senate for concurrence before transmitting a final copy to the President for assent. Although this legislative process represents the most significant evidence of government commitment to upward review of the National Minimum Wage from ₦18,000 to ₦30,000, there are several factors that might impair broad national implementation of the proposed new national minimum wage. Unfortunately, sequence of conversation that produced the negotiated outcome of a 66.7 per cent increase in wage was largely political and barely economic nor empirical. The National Minimum Wage represents one of the most important economic decisions Nigeria will make going into the next decade. It represents one of the most important decisions before national and sub national policy makers. The national minimum wage is a conversation that every Nigerian should be interested in. It is therefore baffling that such a consequential decision is being made without a sustainability and afford-ability study conducted by either a trusted public sector agency or a private sector economic advisory consultancy. In the United States, a spending bill that will significantly increase government current liabilities will not survive the US congress without a sustainability and affordability report by the nonpartisan Congressional Budget Office. A sustainability and affordability study is particularly relevant because it would have provided the empirical basis on which meaningful negotiations could have been anchored. 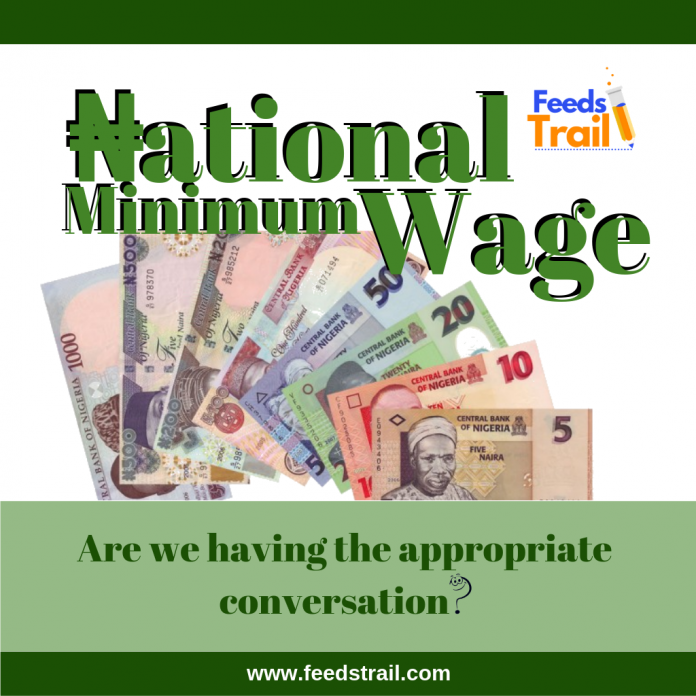 Furthermore, there are several unanswered questions with the current minimum wage conversation that such a study could help provide useful answers to, or at least provide a framework of thinking about core components of the conversation. Below are some components of the conversation that are largely ignored. Capacity to pay: It has been widely reported that most sub-national authorities have struggled to meet the obligation of paying wages and salary of their employees. Simple logic will suggest that states and local government who could not pay salaries at #18000 minimum wage, will not pay salaries when the minimum wage is increased by 66.7 per cent. So, without an affordability and sustainability study, how did they arrive at #30000 as the compromised threshold? Why not #25000? How about #35000? In the absence of any empirical explanation, it seems plausible to assume #30000 as the lucky figure. From all relevant indicators, no tier of government can accommodate a 66.7 per cent wage increase without significant cuts to other spending priorities. To prevent disproportionate increase in recurrent expenditure, a more sustainable approach to minimum wage increase could be a movement along the existing wage curve NOT the pending outward shift in the wage curve. The most practical approach to this method could require downward review of the remunerations of elected public officials and political appointees. The logical question from such exercise could be: what percentage review will guarantee a 66.7 per cent wage increase? The scope of Minimum Wage: A confusing aspect of this conversation is who and what should be covered in the Minimum Wage legislation. The reporting on the content of the new bill suggestthat employers with less than 25 employees can elect not to pay the minimum wage. Furthermore, sectors of the economy like agriculture where seasonal employment is prevalent is exempted from minimum wage. While some of the exemptions do not contravene International Labour Organization’s convention on Minimum Wage, the agriculture sector should have been included because at 29%, it is the sector with the highest contribution to Nigeria’s Gross Domestic Product and consequently employs the highest number of Nigeria’s labour force. Clearly there is a compelling socio economic case for this sector to be included. There are several components of the conversation beyond the ones considered above. Like: what will be the employment effect of 66.7 per cent wage increase? Will it affect Capital Investment? What should be the time-line for implementation? Which sectors are disproportionately vulnerable to wage increase, and will government consider short term measures to incentivize optimum compliance? If incentives are considered, will it have any consequence on the deteriorating state of public finance? The narrow scope of this negotiations is a terrifying indictment of the policy environment in Nigeria. Legislations are widely acknowledged powerful policy tools, but the weight of the evidence in Nigeria offers a deferent sentiment: legislations are impotent policy tools but very potent political tool. Nigeria cannot legislate its way to higher living standard and prosperity. We need to invest in retooling the labour force to position it for greater productivity. The sequence of actions needed to retool the workforce is above my pay grade, it should be the responsibility of public policy makers who are required to demonstrate commitment to reason. Unfortunately, almost every legislation, almost every policy, leads us to the same hunting reality: we have very few policy makers who are committed to reason. Hi there, I am E. Ewa-oluwa; A financial accountant. My professional interest is understanding the nexus between Public finance, Taxation and Inequality. I have out-sized interest in International relations and Politics. As I share my thoughts, I welcome yours. Come let's dialogue.